The scripting capacity of Clockwork Empires is a funny thing. It gives us immense power, the ability to do amazing things. But it’s very easy to get lost in a mess of complexity. 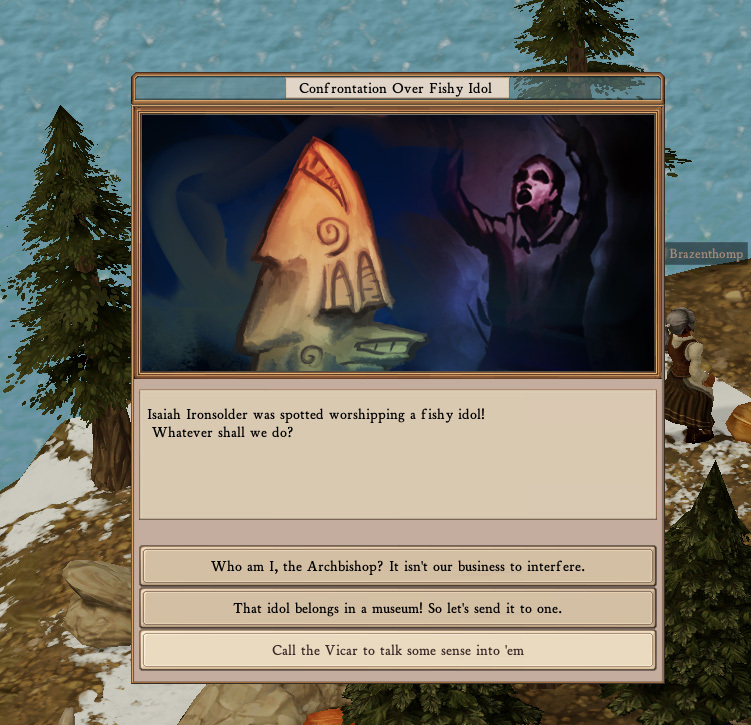 So, yes, we can script an event that essentially holds in itself an entire Twine-like narrative dialog sequence that pushes commands to the game world simulation, waits, then reads states from the game world simulation and thereby lets you interact with the world in abounding narrative scintillation. But be warned: you may lose yourself in this power, and give in, and be plagued forever by spectral script errors. So you’re being invaded. This is important! And now you get to make some choices along the way. Here’s how we start: we’re informed of the invasion, are presented with a choice (which will execute a default option if you stall long enough), and you may notice a new persistent event arc header over in the alerts notification area on the right. Having made a selection, a stub-style alert has been added to the widget. 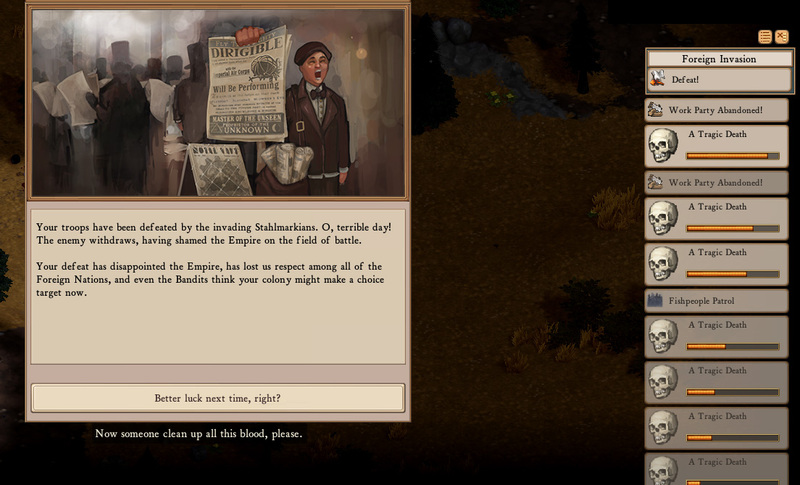 It’s got a tooltip with whatever additional information we think is important to convey to the player. Here we’ve advanced in time a bit. 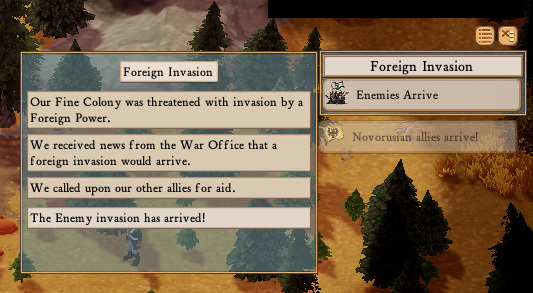 You can see that our Novorusian allies have arrived (though their alert should properly be in the Foreign Invasion box – we specify a parent widget, if any is desired). My mouse cursor is hovering over the “Foreign Invasion” header which gives an expanded mini-history of what’s going on in the event arc. The newest entry in this log appears at the bottom and is highlighted. In this event arc, you get a second choice as well. 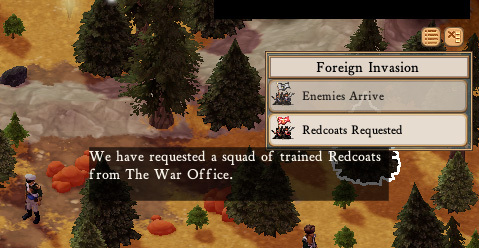 Here you can see that I’ve asked for a squad of temporary Redcoats as reinforcements. The enemy is spotted, the Redcoats arrive. 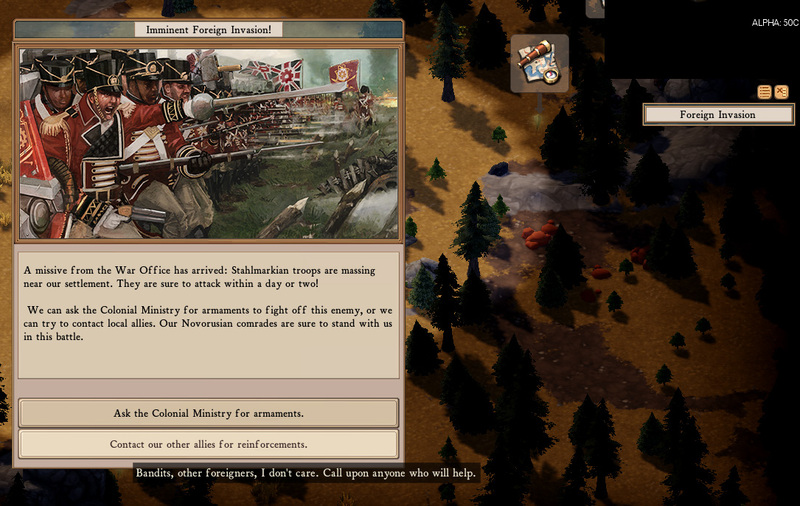 And they’ve already killed one of my Novorusian allies. Yeah, this isn’t going well. You can see all the alerts piling up there, and fading while they time out. Bloody Stahlmarkians right? 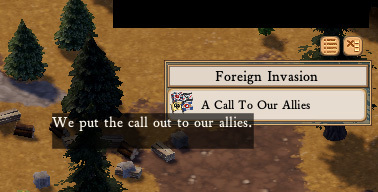 You can see that I have a “Defeat!” stub-alert under Foreign Invasion there. So I am notified of the results of my failure, and life goes on. Well, for the few survivors. This may have gone better had I actually had any troops. Or made more friends with various factions. Or requested different options during the course of the event arc. But that’s all the fun of it! Now, this won’t just be limited to the much-beloved Foreign Invasion event arc. Our primary goal for using event arcs is to power ongoing Eldritch happenings. But if I told you anything about those, that’d be ruining the Fun, wouldn’t it? Okay, here’s a peek. You may notice here that options may open up depending on the facilities you have available in your colony. This will become much more important for providing Special Options to deal with the Various Troubles that may arise. More on that – much more – will be made available to explore in forthcoming updates. Idols and museums? That sure is bound to result in some rising influence, not necessarily in the ministry but in areas more… celestial. I’m just going to repeat my request that when I’m warned of attackers approaching, the game tell me which way they’re coming from to allow me to prepare better. Now that the minimap is functional, this should be workable.